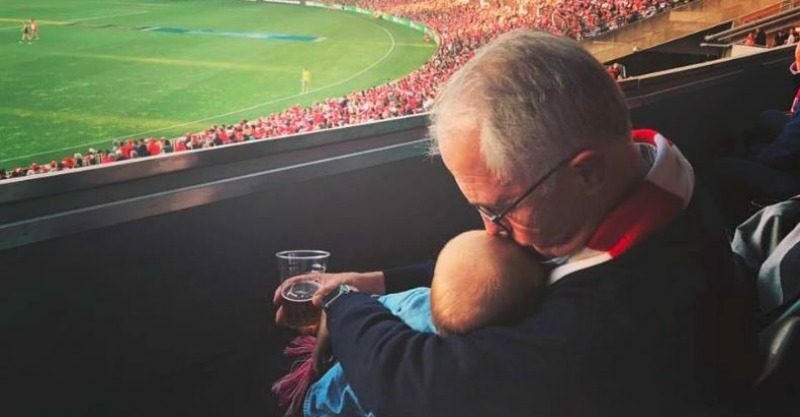 Prime Minister Malcolm Turnbull created a social media frenzy over the weekend after sharing an innocent snap of himself ‘multitasking at the footy’ on Saturday holding his granddaughter AND a beer, prompting a barrage of outraged claims of irresponsible parenting. C’mon Australia, I say give the poor grandad a break! Beer rage, or something else…? As if being PM wasn’t hard enough, Malcolm Turnbull apparently can’t even unwind at a Sydney Swans game with a cold brewskie without the trolls coming out in full force. Okay sure, a lot of people don’t agree with his policies but what’s that got to do with a grandad and his granddaughter hanging out on the weekend? Since when does having a casual alcoholic drink around children become an act of neglectful and irresponsible parenting? I’ve done it myself loads of times (as have zillions of other parents and grandparents I know), and in no way have my children suffered because of it. A few drinks every now and then, especially during celebration occasions such as at the football, is NOT bad parenting. Of course some people do have issues with alcoholism, and obviously having copious amounts of alcohol when looking after little ones is a definite no-no (especially if you’re solo or having to drive later), but in a case such as the PM’s situation it’s hardly a crime. Irresponsible would have been leaving the child locked in the car outside by herself while he was off downing shots of tequila in the arena while watching the match. Let’s keep things in perspective and context. Maybe Pop Turnbull was just minding his granddaughter Alice for a moment while her parents were in the toilet or getting everyone meat pies? Some grandparents don’t spend any time with their grandkids which is way worse than what’s gone on here so everyone needs to just chill out. She may not like a lot of things – particularly when it comes to Malcolm Turnbull – but grandads drinking beer in front of kiddlets is A-OK in Pauline Hanson’s books. The One Nation leader defended the PM on Sunrise this morning, saying she thinks the photo is beautiful and everyone needs to just get over it. “If he had his green tea there, they would be whingeing about that because you are at a footy match with your green tea,” said Pauline, who also noted that she’s spent a lot of time with the PM previously and found him to be a light drinker at best. I’m with you Pauline! Wow, I never thought I’d say that. Greens Senator, Sarah Hanson-Young, also thinks it’s fine and hardly a Michael Jackson balcony dangling situation, which if anything she believes has made the PM seem more personable. Despite the hoards of foot-stomping, finger-pointing, beer-shamers going to town about this photo on Facebook, there were also a few other people supporting the PM’s action. “To me it’s a nice pic of an Aussie Dad at the footy with his grandchild. What would you think of the photo if you didn’t know what he did for a job?” asked one commenter. I agree wholeheartedly. If a parent or grandparent can’t even have one beer at the footy when children are around, well what’s the world coming to? Judging by all accounts, I think you’re a great grandad Prime Minister – keep up the good work! What do you think? Was the PM fine to have a beer at the footy with his granddaughter?